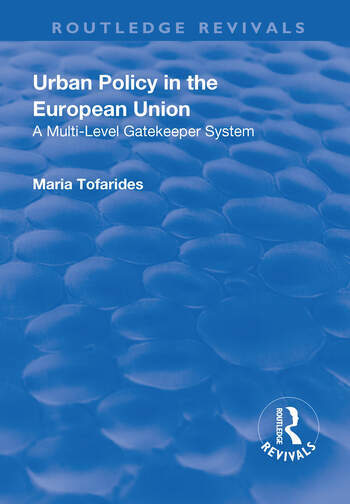 This title was first published in 2003.This book examines the development of urban policy instruments at the level of the EU primarily by the use of Structural Funds under the European Commission's Directorate-General for Regional Policy. This is the first book-length analysis of the politics of EU urban policy. The first section of the book concentrates on how and why the European Commission, with no clear mandate from the Treaties for an urban policy, has ventured into this area. The second section examines in detail the implementation of one of these instruments in two specific cases: London and Marseilles. This highlights the role of central, and other levels of government, in policy implementation. The comparison between the cases brings important insights into the differences in local political structures and practices in France and the United Kingdom. The book demonstrates in-depth knowledge and analysis of the policy area and relevant theoretical works. This includes a large volume of published and unpublished materials as well as valuable information obtained through a series of interviews. The findings have general implications for relations between the Commission and localities, particularly the difficulties of involving ordinary people in European issues. Contents: Introduction; Federal expansion and urban policy: what can we learn from the American experience? ; Supra-national policy in a multi-level government system: tools for the analysis of regional policy after 1988; The birth of the European Union’s urban policy ’experiment’; Gatekeeping in a multi-level government system: the implementation of urban in the United Kingdom; Gatekeeping in a multi-level government system: the implementation of urban in France; Implementation of the urban community initiative in London: the heart of the East End and Park Royal; Implementation of the urban community initiative in Marseille; Lessons from the European Union’s urban policy 'experiment'; Bibliography; Index of authors. Dr Maria Tofarides is a recent graduate of the European University Institute where she completed her Doctorate in Political and Social Sciences. Following her career as a Teacher of Modern Languages in London, she successfully completed a Master of Science Degree in European Studies at the London School of Economics and Political Science, UK. Between 1995 and 2000, she was registered as a Research Student in the Department of Political Sciences at the European University Institute in Florence. Following a conference in Brussels, organised by the Human Capital and Mobility Network, she published a Paper entitled Cities and the European Union: An Unforeseen Alliance (Tofarides, M., 1997, Occasional Paper No. 30, European University Institute).